Emma Crewe's doctoral research explored the politics of aid. She saw through the eyes of a social scientist working in East Africa and South Asia with the UK charity Practical Action. She wrote this up in Whose Development? 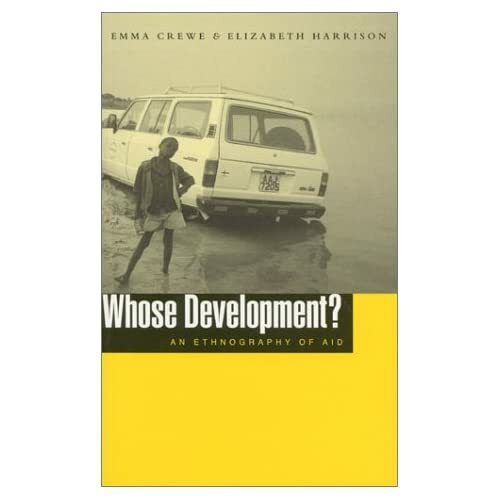 An Ethnography of Aid with Elizabeth Harrison, whose focus was on FAO projects in Southern Africa. Teaching at Sussex University (1993-96), she covered a range of topics from social institutions, culture and madness, environment, gender and development to the application of anthropology. More recently she lectured in the School of Oriental and African Studies (2008-11) on the MA in Anthropology of Development and supervised postgraduate dissertations. With Richard Axelby she wrote a book about anthropological perspectives on aid and development (published by Cambridge University Press in 2013). Their aims are to make anthropology easier for non-anthropologists and development harder for its practitioners. Pretending that aid is easy just makes its protagonists less equipped to respond to the complexity of its world. Between 2014-2017 she joined a coalition of researchers led by the Danish Institute for International studies who were comparing how different agencies work on gender equality and the empowerment of women. As part of this, Emma embarked on a mini-ethnographic study of an international NGO based in the UK, researching its work in the UK, South Asia and East Africa. Her current research interests are the governance of aid and the relationships between parliament and parliamentarians, the state and civil society in the UK, South Asia and Eastern Africa. Between 2005-2011 I was Director of ChildHope. ChildHope is an INGO supporting national non-governmental organisations in Africa, Asia and South America to promote social justice for children and young people. In her time she doubled the income and programmes of ChildHope, enabling partners to reach far more children facing violence, stigma and poverty at home, in communities, on the streets and in prisons. Before ChildHope she was Director of the Centre for Research in Innovation and Science Policy (Hyderabad). As a consultant I have advised grant makers, including the Big Lottery Fund (BIG), Baring Foundation, Diana Princess of Wales Memorial Fund, and Comic Relief. In 1996 I developed BIG's first five year £120m international programme, designing the priorities and criteria for funding. At the Overseas Development Institute I wrote a framework with John Young about improving links between research and policy (2002). This paper suggested that a better understanding of context, links between institutions, and communication of evidence, would bridge the gap between researchers and policy-makers or practitioners. At ChildHope I worked with other NGOs, consultants and grant-makers to develop more effective approaches to funding, planning, and evaluation. We argued for greater flexibility, supporting decentralised innovation and learning, and a more respectful approach to partnership. I am Chair of Health Poverty Action and Find Your Feet, linked charities working towards health and food security for all in international development contexts. BBC Appeals Committee, Member (1994-1998); Friends of the Spafford Children’s Centre of Jerusalem, Trustee (1994-2009); New Lease Trust, Trustee (1996-1999); Intermediate Technology Development Group, Member (1996-2002, 2005-); Community Fund’s International Programme Advisory Panel, Member (1996-2002); World Development Movement, Fundraising Advisory Board, Member (1999-2005); Health Foundation International Committee, Member (2000-2004); Practical Action, Trustee (2007-2014); Practical Action Publications, Company Director (2009-2014); Health Poverty Action and Find Your Feet, Chair (2015-). African Energy Policy Research Network’s Experts Panel, Member (2002-2005); South Asian Research Network on Law and Governance, Board Member (2003-2008); Associate Editor, Journal of Children’s Services (2008-2013); Gendered Ceremony and Ritual in Parliament Advisory Committee (2008-11); University of Bath’s Advisory Group on Well-being and Poverty Pathways (2011-2015); Study of Parliament Group; Association of Social Anthropologists Editorial Board (2012-); Advisory Panel, Sheffield Institute for International Development (2013-).